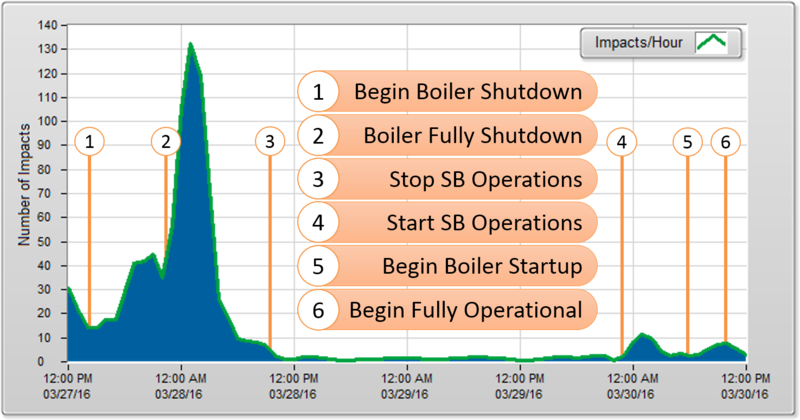 A Proprietary Technology from ITM provides boiler operators with insight into boiler and sootblowing efficiency. With steam costs reaching an estimated $5,600 a day — or roughly $2 million a year — to power sootblowing operations in a single recovery boiler, imagine the savings plant operators could achieve by optimizing sootblowing. The key to sootblowing efficiency is knowing where to clean and when. If your plant utilizes a utility or recovery boiler, do you know where the soot buildup is located in that boiler, or are you cleaning blind? A solution developed by Integrated Test and Measurement, a Milford, Ohio Engineering firm, greatly increases sootblowing efficiency and decreases unplanned outages — both of which will result in significant annual savings. In a typical boiler, fuel is burned inside the furnace, creating hot gas which heats water in the steam-generating tubes. In the case where the fuel is coal or black liquor, the flue gas often contains a significant amount of carry-over, which collects on the boiler tubes causing buildup. This buildup, also known as fouling, decreases the efficiency of the heat being transferred to generate steam while also increasing the risk of plugging the boiler and taking it offline altogether. Typically, soot buildup is removed via the sootblowing process in which rotating sootblower lances are inserted horizontally through the boiler while expelling pressurized steam or air to clean the soot off of the boiler tubes. Estimates are that plants use between 2 and 6 percent of total steam to operate sootblowers. Extrapolate that cost across the recovery boiler industry in the United States and Canada, and those total expenses reach roughly $400 million a year. These facilities operate via unmanaged sootblowing. In other words, there is no real-time indication of where buildups are occurring to inform when and where to operate sootblowers. As a result, sootblowing schedules for each individual lance are determined by common operating practices. Cleaning the boiler tubes in this manner may ultimately get the job done, but it’s similar to putting out a house fire by flooding the entire neighborhood. 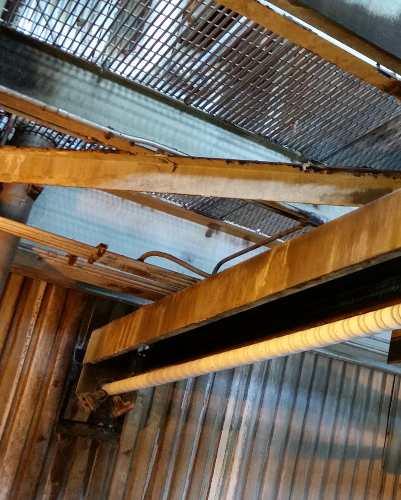 Not only is this sootblowing method an enormous waste of steam — considering some boiler tubes need to be cleaned more often and some need to be cleaned far less often — it can also negatively impact operations. Blind sootblowing has proven to allow buildup to remain in certain areas when sootblowing isn’t occurring often enough. And conversely, sootblowing too often on clean boiler tubes has proven to cause tube erosion, which then leads to expensive unplanned outages. There is a way to optimize your sootblowing operations. The Sootblower Fouling Detection System, or the SFD System, designed by Integrated Test and Measurement is a proprietary technology for the measurement of fouling along the path of a sootblower. The system has two primary purposes. One is to help understand where fouling is occurring in order to optimize sootblowing. The other is to provide real-time data for control systems which will allow for targeted sootblowing. Both of these will result in immediate savings in steam consumption, prevention of tube erosion in areas with little to no buildup and increased boiler efficiency in areas with significant buildup. The Sootblower Fouling Detection System is able to monitor the level of buildup within the boiler in real time. As the sootblower lance enters the boiler, instrumentation along the lance delivers feedback to pinpoint where the steam is encountering significant buildup. An increase in the amplitude of the response indicates buildup, and a consistently low-amplitude response shows operators where no buildup is found. Let’s take a look at how boilers with and without the Sootblower Fouling Detection System respond to areas of low and high buildup along the path of specific lances. The unmanaged sootblowing system continues to operate at the same rate, no matter what the level of buildup. The system with the Sootblower Fouling Detection System, however, actually finds that there is little to no buildup along the path of this specific sootblower. At this point, this crucial information informs automated controls (or plant operators) to decrease the rate of sootblowing. In the end, the SFD system results in immediate savings due to less steam being used and is an excellent method to prevent tube erosion, which occurs if boiler tubes without buildup are cleaned too often. In this example, we again compare two systems – one with SFD and one without. These lances, however, are located in areas with significant buildup in the boiler. The unmanaged sootblowing system does not run the sootblower lance often enough to clean the fouled boiler tubes. Without SFD, operators have no way of knowing that this area has a higher degree of buildup or that the buildup is costing the plant steam-generating efficiency. The Sootblower Fouling Detection System, on the other hand, detects the buildup, and the rate of cleaning is immediately increased through controls logic or via manual input by the operator. Taking this a step further, if the controls system is in place, the sootblower lance can target the specific location of high buildup and focus on cleaning that section. These improvements will directly result in an increase in efficiency of the superheated steam generation process, providing more power for the entire facility. The Sootblower Fouling Detection System is the solution to inefficient sootblower cleaning processes. Managing your sootblowing based on ITM’s SFD technology will increase the overall efficiency of your boiler’s superheated steam generation process while also mitigating the risk of plugging your boiler. In the end, reducing the number of sootblower operations decreases tube erosion, saves steam and saves money. Our goal at Integrated Test & Measurement is to provide efficient solutions to address your company’s needs and to maximize the efficiency or your boiler processes. If you’re ready to take the next step in increasing the efficiency of your sootblower cleaning process, please contact ITM by phone or e-mail and ask about the Sootblower Fouling Detecting System.